As I’ve discussed many times before on this blog I am a massive fan of Dead Gentlemen Productions / Zombie Orpheus Entertainment, in particular Demon Hunters but also their amazing Gamers trilogy and Journey Quest. 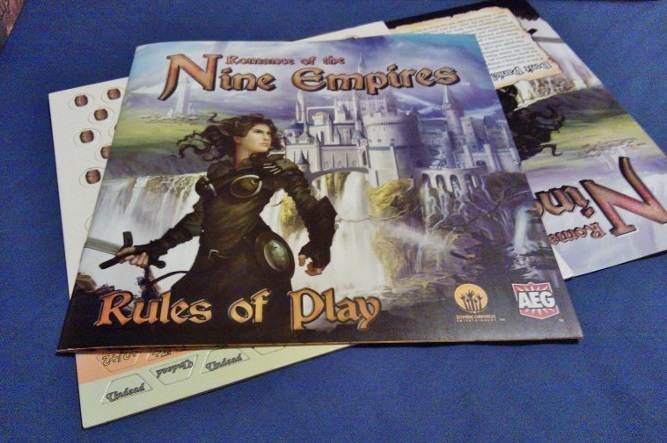 The latest entry in the Gamers series, The Gamers: Hands of Fate shifts the focus from RPGs to CCGs or to be more specific a fictional CCG called Romance of the Nine Empires (R9E). 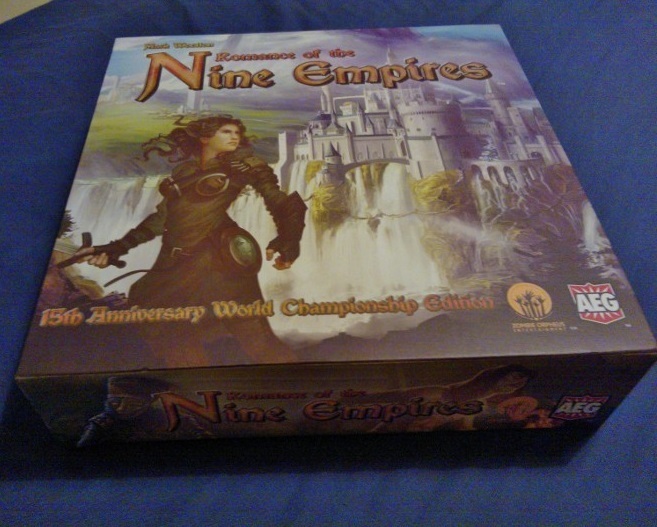 Modeled along the lines of the popular Legend of the Five Rings CCG R9E is an ever evolving game with multiple factions where the winners of the bigger tournaments get to decide upon events in the storyline. True to real CCGs R9E tournament mashes together outlandish gaming staples (factions in the game include traditional fantasy, temporally displaced American G.I.s and aliens) and intricate tactics while also looking like it would be a great game to play. It’s worth noting that Hands of Fate also focuses upon the negative elements of our hobby (namely the idiotic idea of Fake Geek Girls and the general negative treatment of women) to which I’ll just point people to Nothing to Prove by The Doubleclicks and Anita Sarkeesian’s Tropes vs Women in videogames (which while focusing on videogames is just as relevant here). For those of us who exist outside of the Gamers universe a box set of the R9E game is available thanks to being one of the films Kickstarter stretch goals. Not only is it real it’s produced by AEG themselves who have drawn upon their years of L5R experience to produce the Romance of the Nine Empires 15th Anniversary Set which includes 5 faction decks, a full set of rules and additional cards for customisation of the included decks. Being the fanboy that I am I pre-ordered the game through Orcs Nest, my FLGS. I’ve not had a chance to play it yet but wanted to provide an overview of what’s included for anybody that might be interested in it. Holden – A small but cunning and resourceful Kingdom. Malchior – A proud and harsh warrior people living in the ruins of the ancient dwarven empire. Ixhasa – An undead army risen from a sunken and corrupted empire. The Displaced – A World War II battalion accidentally transported to this strange world by the Los Alamos atomic bomb test. The Ord – An enigmatic and technologically advanced alien race. Plus an additional pack of cards to modify each of the decks to your own preference. Also included is the main rulebook, an introductory overview and a set of cardboard tokens, a nice addition that saves on the need to track information through dice. Each faction within the game, while sharing essential card types is unique and built around different themes and styles of play. 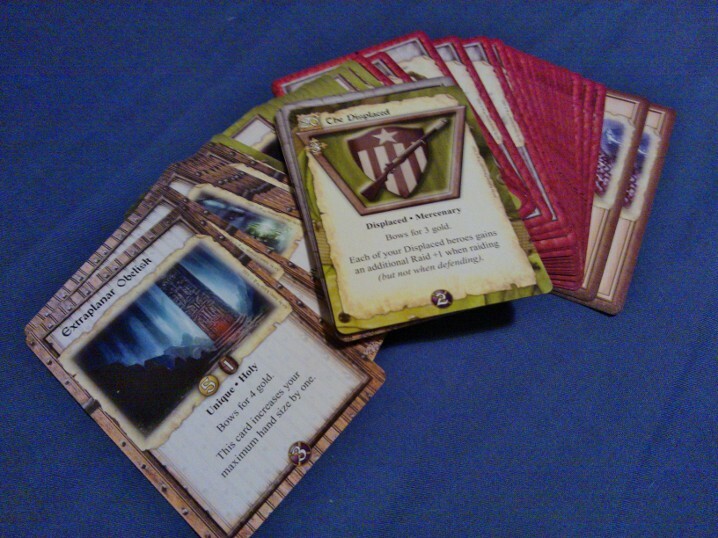 Holden for example is a questing deck while The Displaced favour raiding enemy castles for food supplies. In keeping with the distinct themes and faction backgrounds each deck is designed with its own aesthetic feel with unique artwork and presentation even for cards that are functionally similar to those in other decks. As always for AEG products the quality of both the cards and the artwork is high, impressive given the game essentially exists as a secondary bonus attached to the movie. While I’ve yet to play the game reading over the rules makes it clear that a fair amount of thought has gone into not only keeping them consistent with the events of the movie but making them viable and interesting as an actual game. 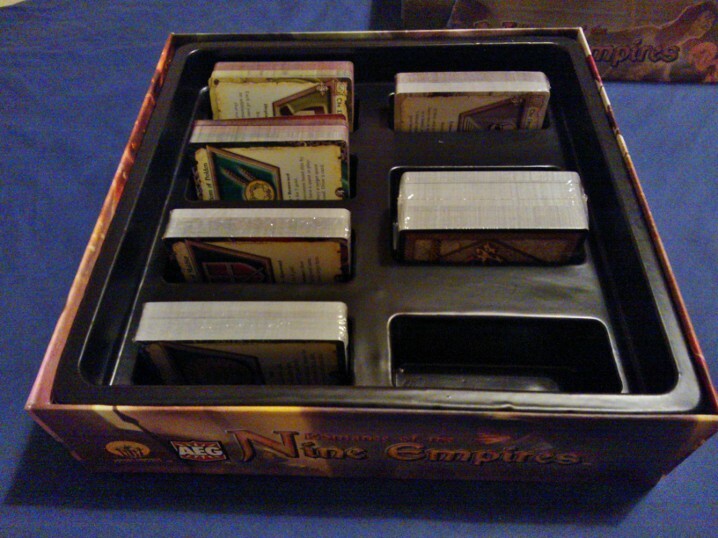 Each deck has different styles of play, with different strengths and weaknesses and the game itself includes multiple win conditions that align with those of the movie (renown, military and starvation). With only 5 factions included in the set there is also ample opportunity to expand the game through the inclusion of the four remaining factions should the game sell well or as stretch goals in future Kickstarter projects. The set has an RRP (in the UK) of £30 so I would certainly recommend it for anybody interested in CCGs but who doesn’t want to be continually shelling out for the newest set, especially if you can get a group to split the cost which makes it as low as £6 per deck. The R9E CCG engine is based on the old Legends of the Burnings Sands (LBS) CCG which I always thought was quite superb. I did wonder if it was based off of something, I could see the similarities to L5R but wasn’t aware there had been a Burning Sands CCG. Well spotted. LBS used water rather than food and the stories worked slightly differently from quests, but the same basic engine. I have not tried a LBS vs R9E game yet but I think they should play together OK.